Welcome to our Lexus ISX product catalog. This catalog includes all Lexus IS 3rd generation models including 200T, 300, 250, and 350. Please note that individual products may have different fitments -- please always check fitment specifications for every product. Please do not hesitate contacting us, if you are not sure if our products fits your car. 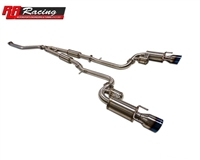 The products displayed on this page are RR Racing engineered products developed specifically for your Lexus and proven on the street as well as on the track. We are constantly developing new products for the IS-X models, you can learn more about our IS-F Project here.